It’s been nearly six days since over 2,000 members of the Tehreek-i-Labaik Yah Rasool Allah Pakistan camped around the national capital as a form of protest. The protesters are demanding the resignation of the federal Law Minister due to a post-haste alteration to an oath undertaken by law-makers. Their protest has put the regular routines of the inhabitants of the city in utter chaos. 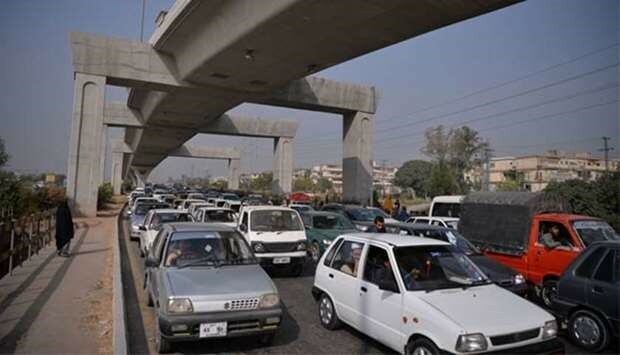 The protesters have camped over a flyover in Faizabad connecting Islamabad with the adjoining garrison city of Rawalpindi, a route that thousands of people in Islamabad travel through every day to work at the capital. Youngsters armed with clubs guard the site. They search anyone approaching and refuse to let any vehicle enter the bounds, streaming those who come near with stones. “The protesters have baseless demands. Authorities should deal (with) them with force and move them away from the road,” said Fayyaz Hussain, a commuter struggling to reach his office since two hours on Monday. Despite the troubles the suburbanites are facing, the authorities did not take any necessary measures against this protest. “Use of force is no option at the moment,” senior Islamabad official Shoaib Ali told AFP. He also said that the main priority was negotiations with the protesters. The protesters vowed to not move an inch until their voice is heard. “Either the minister resigns or we are killed or arrested: we will not leave this place,” Pir Muhammad Afzal Qadri, one of the group’s leaders at the protest site. Another report says that, upon the force of TLYR, administrations had no choice and involuntarily limited the service of Metro Bus between twin cities and private inter-city transport service at Faizabad Bus Terminal. Routes leading to Faizabad Interchange are blocked by placing barricades. Contingent of police, Rangers and other law enforcement agencies, stationed to maintain the law and order situation, trying to resolve the issue with talks rather than showing any harshness. The district administrations Islamabad came up with a plan to avoid any incident. Protesters are blocked from entering the federal capital, especially in the Red Zone. Heavy contingents of police, Rangers and Frontier Constabulary stationed themselves in the Red Zone and other parts of the city. ان بیغیرتوں کو سمندر میں پھینکنا چاہیے تاکہ ملک میں امن قائم ہو جائے. Mr Tayyab look at your language. Aasqay Rasool with such a bad tongue. You are doing a great duty to religion in general. so they didn’t protest when the bill was in motion but they are scoring points now. Sooner or later it will be incurred that this was just for the political purpose only. I don’t usually speak for such matters but the people have gone through enough and it should be stopped now. یہی وہ فرق ہے جو ایک مذہبی اور غیر مذہبی انسان کی سوچ میں ہوتا ہے. اگر آپ ایسا کرنے میں ناکام ہے تو پھر اپنے عقیدے کا پرچار چھوڑ دیں، کیونکہ جو عقیدہ آپ کو نا بدل سکا وہ کسی اور کو کیا بدلے گا. they r protesting against the amendment in OATH for Trust upon Huzrat Muhammad P.B.U.H, they want the Law Minister must resign, but unfortunately all parties are equally responsible for this amendment. that’s why No political parties speaks. Only criticism on them. Be a Muslim, at least support their thought. thou the Govt declared amendment reverted but sources say still it’s not rolled back. Don’t know what we call FC,Police who now confronting this protesters. What was the post-haste alteration that was done by the law minister? I have lived in Europe and in developed countries for many years. They are progressing because they do not discriminate on the basis of religion. Believe me sooner or later all Pakistanis will realize that religious discrimination has no place in the modern world Pakistan has to end all discriminatory clauses in the constitution. Religious discrimination has no place in the modern world. bhai Khud bahir bethy or Pakistan ki fiker?? agr itni fiker tu yaha a k baat kro.. ye jo tahreek hai Pakistan ki sb peaceful party hai…Pakistan jb se bna aj tak koi sabit kry Ahl e sunnat jamat ne kbi hangama kia ho…. but jb baat Rasool Allah s.a.w k deen ki ho tu or jb huzoor s.a.w ki gustakhi begart insan sun kr beth skta hai momin ni… Protest krny walo ki yehi demand jis ne Khatam e Nubawat k law me changes ki us ko Saza di jaye…. to heeelll with your Comod thinking. I think people should realize that there is nothing political in it..Its about our beloved Prophet (S.A.W.S)…. Govt is responsible for Traffic Jams… they are in power… They should Accept the genuine demands and resolve the issue instead of blocking roads and prolonging it……..
& About Public……they have no issue when there is political dharna of PTI & have issues when its about our beloved Prophet (S.A.W.S)…May Allah give Hidayat to everyone..
Can anyone tell about the situation of Islamabad to lahore bus services like faisal movers and bilal daewoo. Are they still available there or they have changed to someplace else.